Illinois’ “Rising Stars” Meet with Key Policymakers in D.C.
Fellows from the Illinois Road & Transportation Builders Association’s (IRTBA) “Emerging Leaders Program” (ELP) March 22-23 made their annual visit to Washington, D.C. 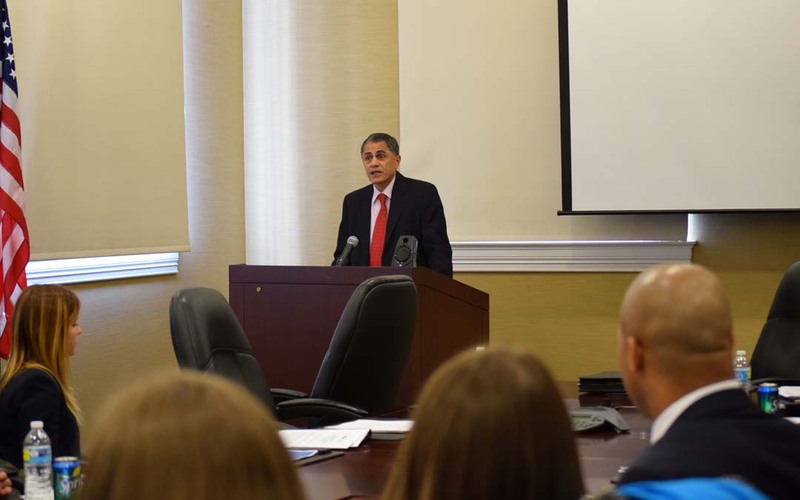 Highlights included a special session at ARTBA’s headquarters building with Victor Mendez, U.S. Department of Transportation deputy secretary, who provided an overview of the agency’s current initiatives and offered them career advice. The IRTBA ELP program, modeled after ARTBA’s Industry Leader Development Program (ILDP), helps rising industry stars play a key role in shaping the future of the transportation design and construction industry. ELP participants visit ARTBA each spring during a trip to the Nation’s Capital with IRTBA’s officers and board members. This year, those “Distinguished Leaders” included IRTBA Chairman Dave Rock of IHC Construction, ARTBA Executive Committee member Charlie Gallagher of Gallagher Asphalt and IRTBA President & CEO Mike Sturino. See the full list of participants. ARTBA President & CEO Pete Ruane, provided the group with a federal legislative and regulatory update. While on Capitol Hill, the IRTBA members met with several members of Congress and staff from their state to discuss pending transportation policy issues. ARTBA encourages affiliated chapters and members to bring groups to Washington, D.C., as IRTBA does each year. We will be glad to provide a briefing by ARTBA staff and arrange for visits with high-profile policymakers as well. Please contact me for more information.